I was curious how the 2011 drought in Texas translated into crop yield statistics. 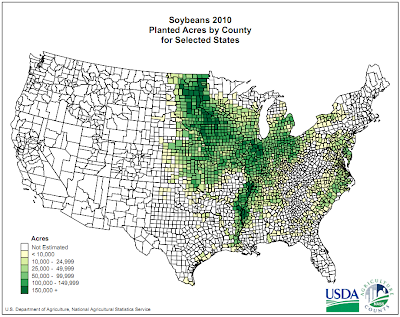 I happened to pick on soybeans to start with, and generated the graph above, which shows whole-US and Texas soybean yields. Sure enough the drought has caused a 30% or so drop in Texas yield in 2011 versus the 2000-2010 average. However, for the US as a whole, 2011 is well within the normal range of variation. However, the graph raises a larger question: over the last sixty years, US yields have been generally increasing (consistent with the usual technologically driven yield improvements in most crops in most places). 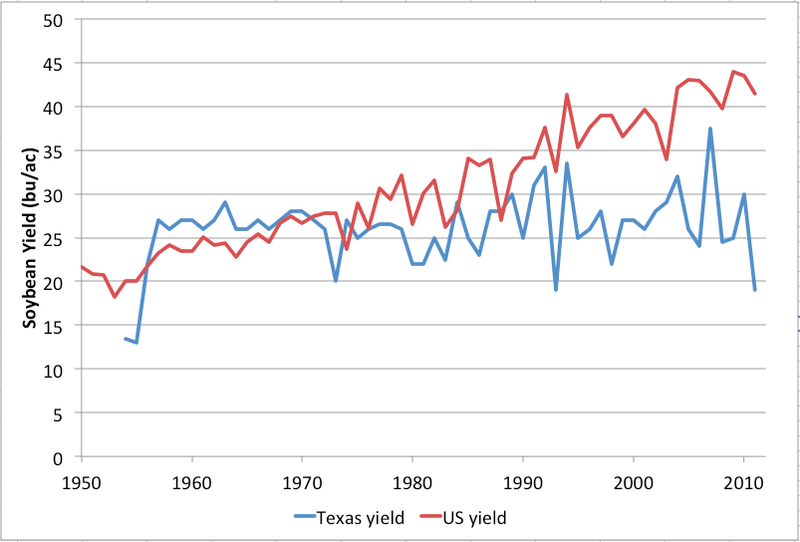 However, Texas yields have been basically flat the entire time. What's up with that? Theories are solicited in comments. 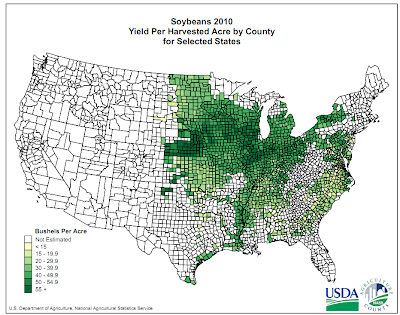 FWIW, here's the USDA's county level yield map for soybeans in 2010 - clearly Texas is well outside the sweet spot for growing soybeans, but there is production along the Gulf coast. 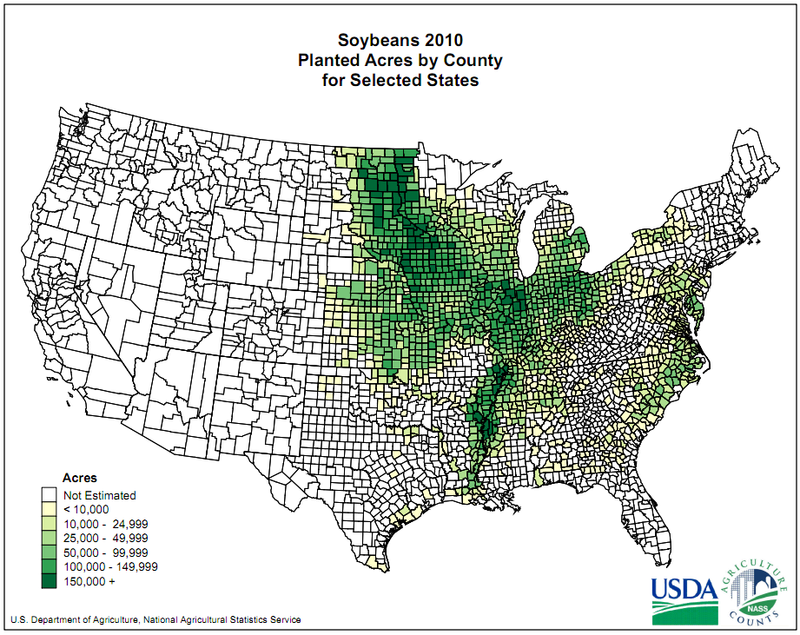 I would want to know how many acres were being planted in Texas, and whether they were the same acres. 4) Texas farmers are bringing on line more low yield soils, or Midwest farmers are concentrating on high yielding soils (or are better able to use new things, such as GPS for fertilizing and yield management). The immediate conclusion, based upon your drought series, is that it is the heat and lack of moisture that is hurting yields, and that is the horse I would bet on. But those other factors could probably be teased out of the data, and subject to a pretty simple regression analysis, to rule out or in. 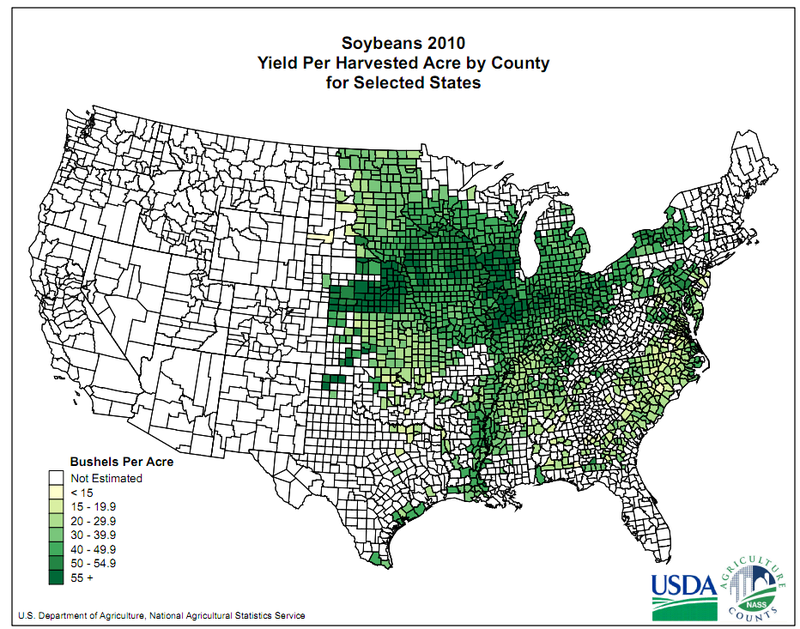 I'd also want to look at production cost per bushel in Texas, vs. the higher yielding areas. 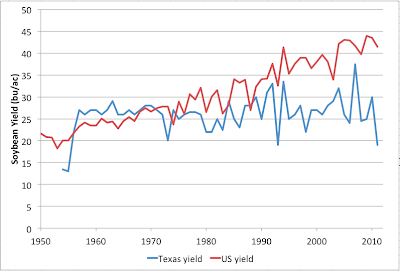 Geography, infrastructural and organizational peculiarities could well mean optimum profitability in Texas occur at lower yields/area than in some other places. And while access to water is likely one such issue, there could well be others as well. I don't know if the temperature trend in Texas matches. Soybeans don't seem to be the big crop in Texas, for one thing. AG there depends heavily on the depleting Ogallala Aquifer, for another.